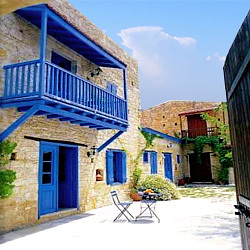 The family home of Archbishop Makarios III is located in the village center and is now under the supervision of Cyprus cultural services. 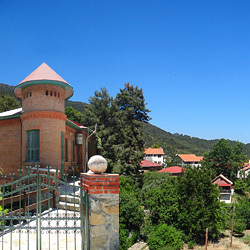 Anyone can visit the house, where an employee of the museum can guide them around. 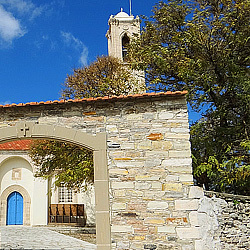 The Folk Art Museum is owned and run by the Community Council of the village of Panagia. 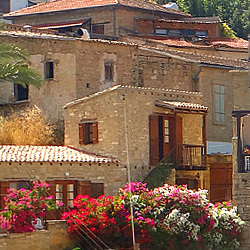 It was purchased from private collector and its overall value is around 70.000 Euros. 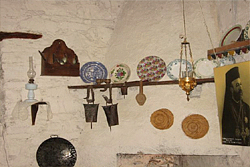 Located under the building of the Community Council it contains a large collection of traditional objects and works from the village area. 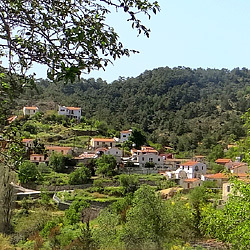 It also has a lot of old tools and photos of the inhabitants of Panagia on numerous occasions. Currently it is scheduled to operate only in the morning. 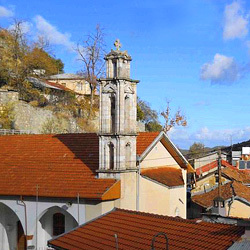 The museum is located in the building of foundation in the center of the village. 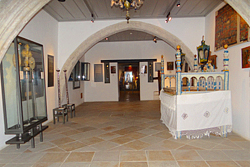 It contains a collection of personal objects and photos that belonged to Archbishop Makarios III. It is open at specific daily hours. 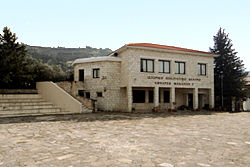 The library is located above the museum building and operates the same time as the Museum of Makarios III. 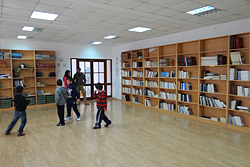 It contains a varying collection of books about history and about culture, as well as books about the community of Panayia and of the life of Archbishop Makarios III. 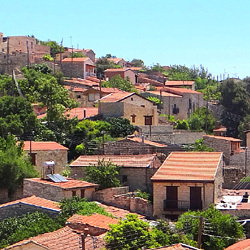 In addition you can find poems and traditional songs. 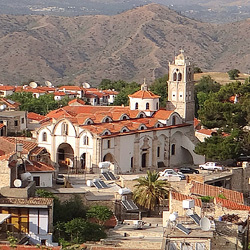 The creation of a treasury for the monastery was made possible in 2001 following an initiative by Abbot Dionysios and a donation by the Leventis foundation. The Treasury keeps valuables like ancient icons (with the oldest dated in the 14th century), crosses, cherubims, Venetian chandeliers (murano), candles, scripts, vestments, metal sticks used by archpriests, trays used for the Holy Communion (with the oldest dated int the 15th century) and a lot of other things. 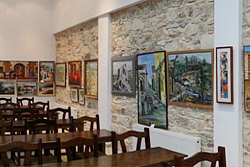 The art gallery features fifty six artworks by Cypriot and foreign artists. 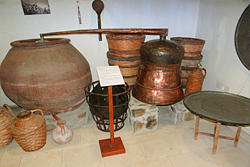 These were bought by Abbot Dionysios during the period 1978-2010. 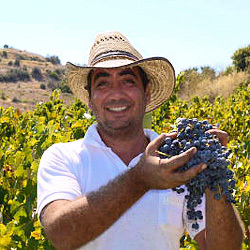 The collection includes works by artists G. Kotsonis, A. Makariou, Chr. 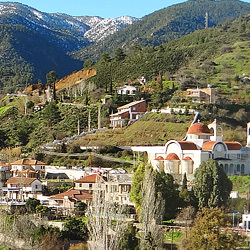 Foukaras, Soula Leipsou- Yiangou, Mariam Foukara, Rinos, Andreas Asproftas, G. Kepolas, G. Koumoulos, Savvas Christodoulides, Nikos Efstathiou, Eyanthia Kouma, Ioannides, Lazarou, Irene Athanasiou, Avramides, Demetris Palates, Koullis, Tania Gerhard, Anna Kelogregoriade, E. Adamidou, Thraki, L. Stavrou, Yiolanda, Maria Kotsoni, Christos Daniel, Christos Demetriou, A.M. Karagiannis, Katia, Suzan Kerr, John Wilson, Wipper Gilbert, Hikmat Gregorian and George Syrimis. 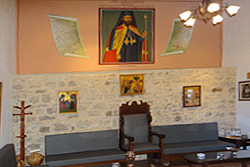 In this hall there is a wall painting depicting Archbishop Makarios C΄, holding the scepter of the Church of Cyprus and wearing the red cloak. 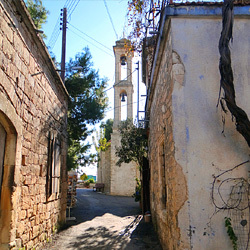 On the left and right there is an extract from the monastery’s guest book written by the Archbishop on the 27th September 1948 when he was Bishop of Kition and on the 29th August 1951 when he was Archbishop of Cyprus. 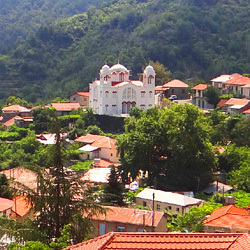 The Chrysorrogiatissa monastery, in its effort to promote theology and consequently the anthropology, sociology and cosmology of the Orthodox iconography, established the icon study centre in 2010 in the monastery’s building. The iconology centre aspires to become an international study centre through conventions, publications, hosting of scientists etc. 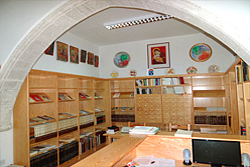 The A.G. Leventis foundation’s donations, have provided a rich library on the subject of icon study. 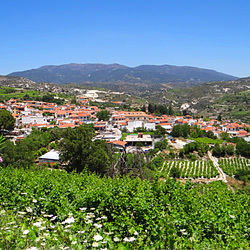 The library is constantly updated and also collaborates with the university of Cyprus library and the department of theological studies of the “Neapolis” university as well with the library of the university. 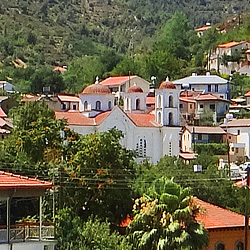 The centre publishes the bi-annual magazine « Εικονοστάσιον» having icon study as its main subject.